Employment discrimination for Canadians with disabilities. The disabled population in Canada has always had to overcome many obstacles in order to gain equality. In the Canadian work force, most disabled people had to fight poor health and exclusion. To illustrate how inequality in the Canadian workforce has affected the disabled population in the past and present, I will be examining the state of the Canadian disabled work force. In 2006, people with disabilities were less educated, older, more likely to have fair or poor health, and lived alone. These factors made it very difficult to keep any type of employment and made the unemployment rate of the disabled people high. In fact, according to the 2006 study on Education, Employment, and Income of Adults With and Without Disabilities from Statistics Canada Table, 8.6% of persons reporting a disability were unable to work. There are many reasons why the unemployment rate for disabled people is so high, such as: more working hours for the able bodied people, no training/education for employment for the disabled people, and lower pay for the disabled people. These inequalities create barriers between disabled people and the rest of the work force. Disabled and non-disabled people have different work patterns. On average men with disabilities work 15 weeks fewer each year than able-bodied men, while women with disabilities worked 11 to 13 fewer weeks than able-bodied women. 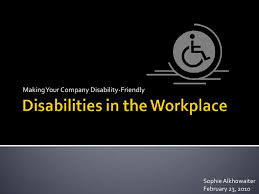 These differences make it harder for the people with disabilities to establish solid working relationships with fellow employees which can create a feeling of exclusion for the disabled person and certainly means he or she will earn a much lower income. Statistics Canada, Survey of Labour and Income Dynamics, 2006. The lack of available training opportunities for the disabled population is a huge issue and one of the most common forms of inequality. Eighty three percent of the disabled people cited that they wanted training for their current or future employment, but were unable to do so because the cost was too high or because some employers would not accommodate for their disability. This inequality has caused the disabled population to suffer financially and it has increased their unemployment rate. 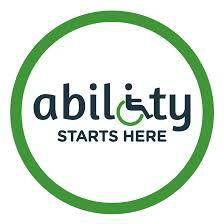 In Canada, disabled people currently earn 75 cents for every dollar earned by an able bodied employee. This pay gap is not only unfair and it is causing a crisis for the disabled population. Without the extra money to help cover the costs of medical supplies and adapted equipment they face increased unemployment and worsening health, which then leads disabled people to be excluded from society. Exclusion in the workplace is a major problem for Canadians with disabilities. Some solutions include changes to income support programs, employer support for workplace accommodations, and government programs to protect the disabled people by encouraging inclusionary practices and programs. Disability rights organizations advocate to ensure that the disabled population is included in the workplace and this has influenced union bargaining priorities. These developments have made people more aware of the inequality issues facing the disabled population which has helped create change. 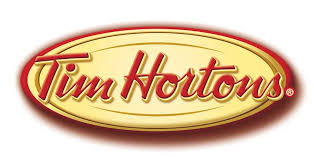 He is the owner of seven Tim Horton’s franchises and he hired over fifty disabled workers and urged fellow business executives to do the same. Unfortunately, more changes are needed to end this ongoing problem. The inequality of the disabled people in the workplace has to end because it is discrimination, which is against the law. The bottom line is that the economic and social inclusion of persons with disabilities requires a lot of work from the governments, businesses, schools, community agencies, and the individuals themselves. Together we can stop the inequality facing disabled people in the workplace. 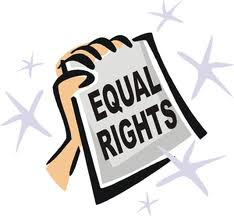 1 Response to Employment discrimination for Canadians with disabilities.